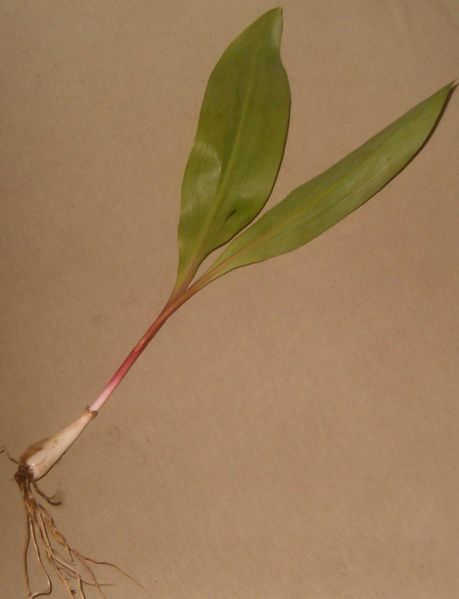 Ramp, or “Wild Leek”, CC: Attribution-Share Alike 3.0 Unported, Courtesy Wikimedia. We are almost there–T minus four days until move in and much of our big renovating will be done as of tomorrow. We will be living without kitchen counters for a couple of weeks once we move in, as well as without a stove and sink for a while, so this may well be the last blog post I write for a bit as I see Co-Op deli dinners and eating out in some of our future. But we’re excited to create this new home together, and hopefully to have all of you there eating meals around a table together in the near future! Today we were at the house after work checking out the kitchen progress. As always, I was wondering what I might be able to cook with little food in the cabinet, and most of our pots and pans packed away. A few days ago, while tilling our second raised bed, I pulled out what I assumed were irises so I could transplant them elsewhere, but quickly found that I’d pulled up some kind of onion. They looked like really large green onions, with a leek-like stem, and leaves like irises. They wer actually ramps. Ramps are kind of an Appalachian thing–people down here eat them with beans and cornbread or sauteed with bacon grease. Now I’m wishing I didn’t pull all of them, because I should definitely plant some more for next season–apparently they’re actually a protected species in some places! 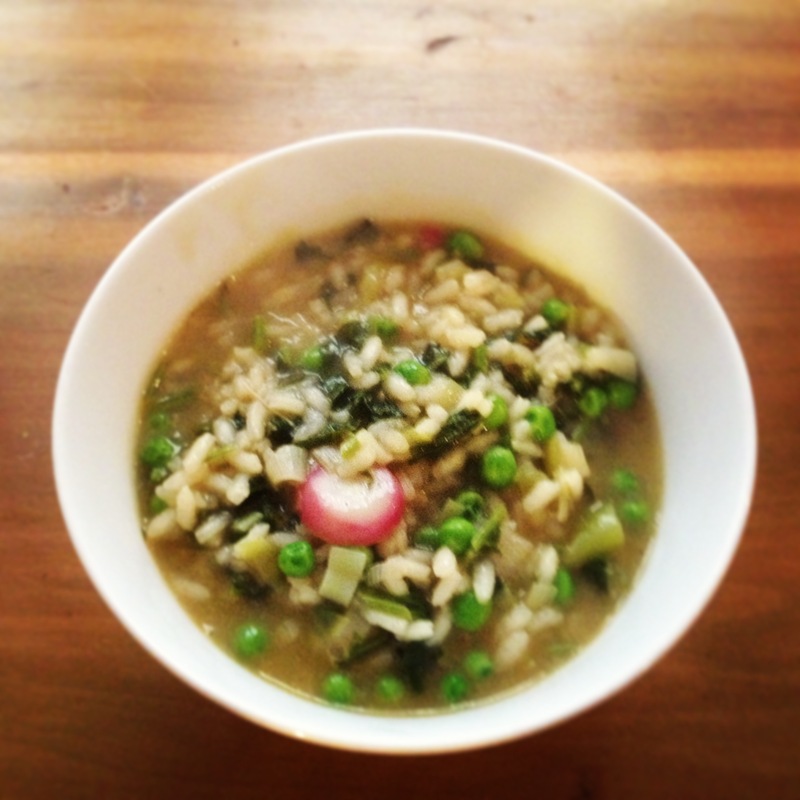 Anyhow, with my surplus of ramps, and some radish plants still needing thinning, I figured I’d make some kind of risotto–my go to “everything but the kitchen sink” solution. Of course, I realized once we were home that we didn’t have any white wine in the house, so I figured I’d try gin–why not, and the juniper/herbally flavors I thought might be nice with spring onions and radishes. We also didn’t have any cheese, which is all the better since I really shouldn’t eat it, so the key to cheeseless risotto is adding butter at the end–what the French call monter au beurre–in order to emulsify everything and give it some rich mouthfeel. Frozen peas (one of my favorite go to pantry items) and lemon juice rounded it out. I’m excited to have put this together on a whim, and look forward to taking advantage of more Appalachian indigenous ingredients, like ramps. Enjoy! Heat the veggie stock in a large pot. In the meantime, heat the olive oil and 1 Tb. of the butter in a heavy pan over medium. 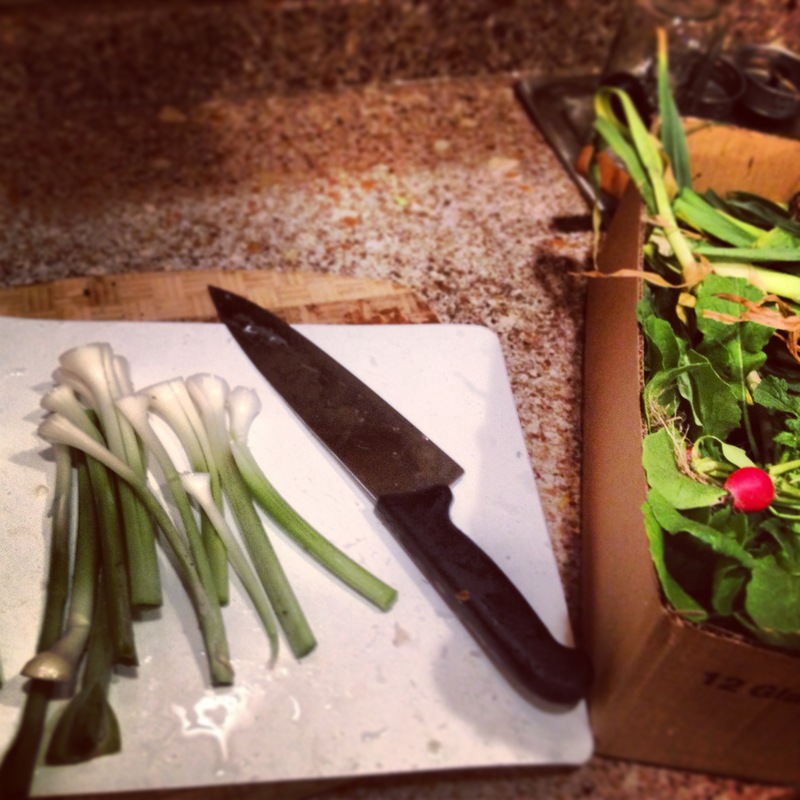 Clean the leeks well of any dirt and chop off most of the green leaves. Cut off the bottoms, and similarly to leeks, peel off the outer layer and rinse well to get rid of dirt. Chop ramps fine. Saute the ramps in the olive oil and butter over medium until tender. Add the rice and stir, coating well, for 1 minute. Add the gin and stir until absorbed. Start adding in the stock, about a cup or so at a time. Simmer and stir, adding more until you’ve used a little more than half of the stock. Stir in the radishes and radish greens. When you’ve added in your last ladle of stock, stir in the frozen peas and cook slowly till most of the stock is absorbed. Add in the lemon juice and zest and stir. Add in the remaining Tb. of butter and stir till melted. Serve hot with plenty of fresh ground black pepper. Serves 4-6. Other than eating too much, we had a wonderful holiday, but are now glad to be settled back down in Knoxville after lots of travel. If you’ve ever visited my parents’ house in Kentucky, you’ll know that there’s always a big container of pimento cheese in the fridge. No matter what. And no matter how many times I say my lactose-intolerant self won’t take a bite, I always do, which is why I wanted to share this family favorite recipe with you all. Pimento cheese has had an in-vogue moment again, at least here in Knoxville, along with deviled eggs, homemade pork rinds, and all kinds of other bad-for-you Southern food that trendy “locavore” restaurants here help eaters justify since the ingredients are easily sourced from nearby farms. I mean who can resist free-range deviled eggs with sriracha and homemade chowchow? I’m glad Southerners are finding their groove and celebrating their food culture (even if it might give us all a heart attack). For one, it means that people are learning not to do sacreligious things, like pureeing one’s pimento cheese in the food processor, or God forbid, adding something sweet, like Miracle Whip, to it. 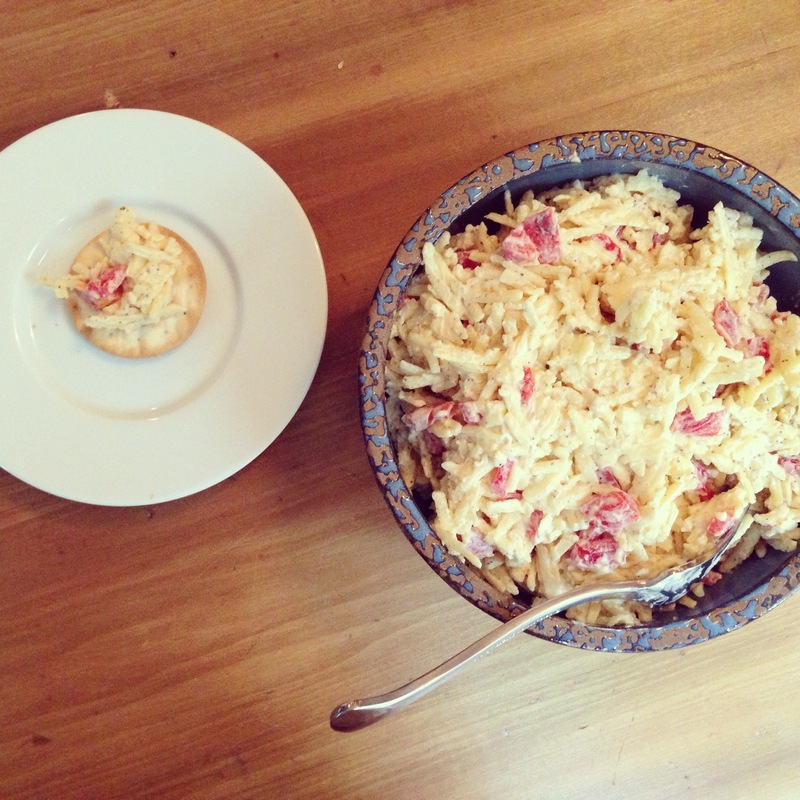 Nevertheless, pimento cheese is one of those things you just don’t want to mess with. So, please don’t add jalapenos, or barrel-fermented organic pickles, or what have you to this. Just stick with the basics and keep it simple, simple, simple. The trick here is to start with good ingredients, making sure to especially use good mayo (I always use Hellman’s) and good cheese (Cabot cheese is the best–I’m looking at you, Sara). My family always uses sharp white cheddar and roasted red peppers, which might sound kind of shishi, but fresh roasted peppers are a lot better than the little jars of pimentos that sit mouldering on the back shelf of your Piggly Wiggly (plus, you can’t even find pimentos usually up North or in Europe). The other trick is to absolutely not add too much mayo. The mayo should just barely bind everything together. Other than that, when serving it’s best with bland crackers. Saltines, water crackers, or Melba toast are all great options, but just make sure that your saltines aren’t fully salted, or the end product will be too much of a salt bomb. Grate the cheddar cheese using the grater fitting on your food processor, or by hand. Grate the onion and add to cheese, making sure to include any juice. Sprinkle in the diced roasted red pepper. Gently fold in the mayonnaise a bit at a time, adding more or less, just until the mixture binds together. Season with plenty of freshly ground black pepper. Chill and serve with bland crackers or make sandwiches (tomato is nice on a sandwich with pimento cheese). My cooking career in college encapsulated some highs and lows. On a few golden occasions, I was able to improvise and throw ingredients together into dishes that were both magical and impossible to ever replicate (“Break Up Macaroni and Cheese” and “Everything But the Upstairs Kitchen Sink Chili” come to mind). At other times, I undercooked potatoes in Potato Soup, failed to cook off the vodka in vodka sauce, and blew up one of my saucepans by forgetting about it on the stove on high heat. High and lows, like I said. But one of the most enduring dishes from that period is Cajun Skillet Beans, a gem of a recipe from the cookbook Moosewood Cooks at Home. Naomi and I made this during our sophomore year for a dinner party (N, you remember this?). Four or five of us crowded around the tiny coffee table in our shoebox apartment on Summer Street to chow down on these spiced beans and veggies. That was our first real apartment, our first real kitchen, and just the beginning of a long tradition of gathering our friends to eat food (in apartments of varying quality). I’ve held onto the cookbook, and this recipe in particular, in the ten years since. I like it because it can be made out of pantry ingredients, it comes together quickly, and it has some interesting flavors. Back in 2002 we paired it with Saffron Orzo, which was great, but saffron is pretty expensive so our more fiscally and nutritionally responsible 2012 selves can make it with BARLEY. Like all so many great recipes, it starts with dicing the onion, mincing the garlic, and sauteeing them in oil over medium heat. 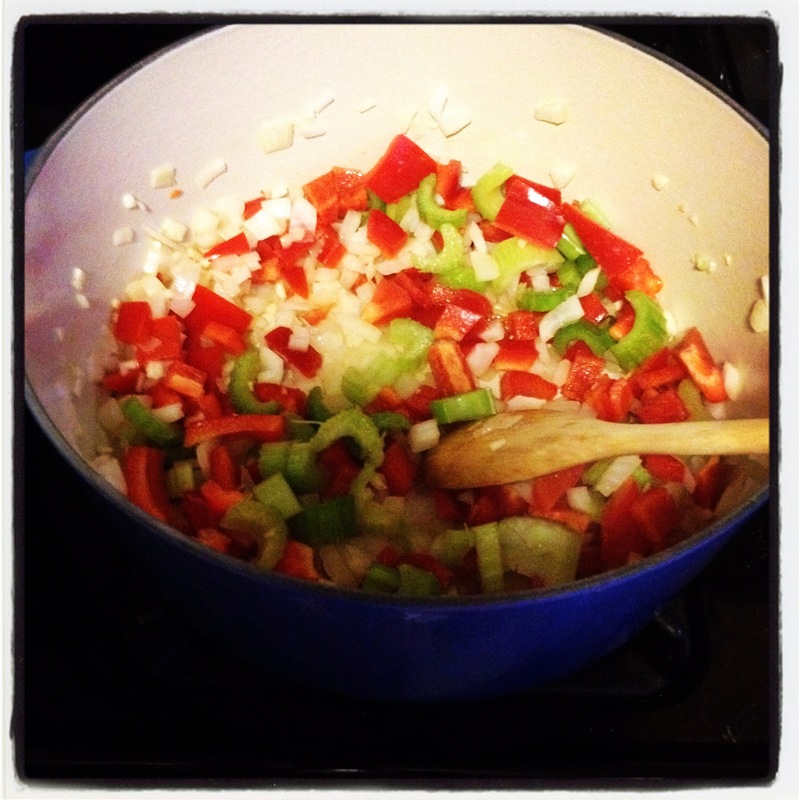 Chop the peppers and celery and add to the onion and garlic after about 5 minutes. After another 5 min, add the spices and stir. Cover the skillet or pot for a few more minutes so the onions get slightly golden. Add the tomatoes, honey, and mustard. Let simmer another 3-5 minutes. Rinse the beans and add to the pot. Stir and let cook an additional 10 minutes before serving. 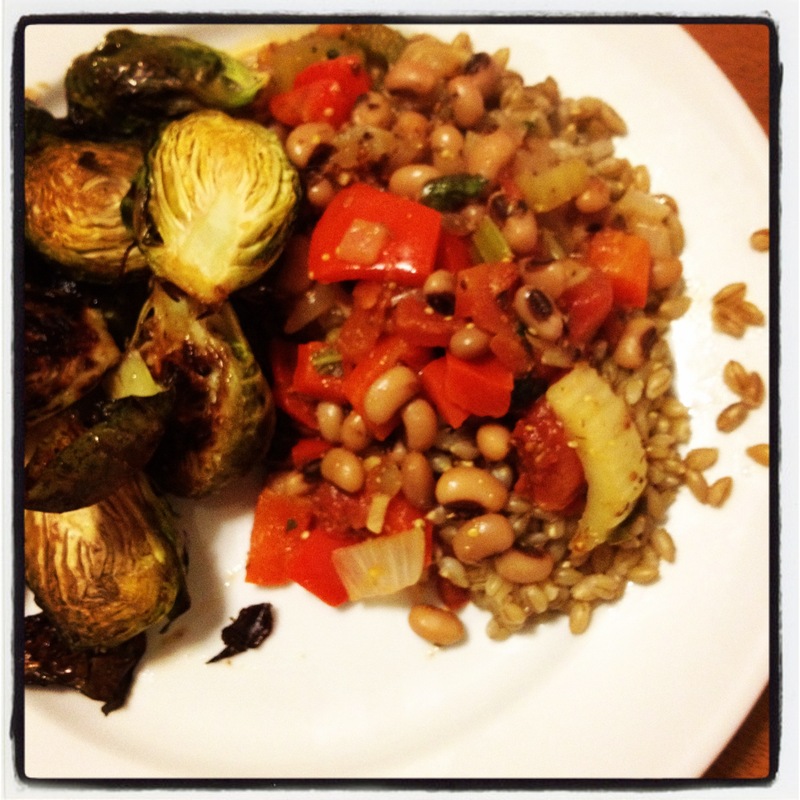 I cooked a cup of barley to go with and served with roasted Brussels sprouts. Also, we’re on a perennial mission to find the best cheap red wines out there, and recently we’ve been trying a lot of blended wines because we’ve learned they can be a good bargain. We tried this one last night with our skillet beans -it was about 10 bucks- and pronounced it delicious. Jalapeno Cheddar Cornbread Does Mt. Washington! I’ve been trying to get my friends in med school to do a chili cook off for a long time. We’re talking… 2+ years. As my birthday rolled around this year and we started talking about what to do (dinner out? beer garden? bowling??) we all agreed that given the utter insanity of this year and our very different schedules, an all-evening hang out at my house where everyone could trickle in as they pleased was in order. 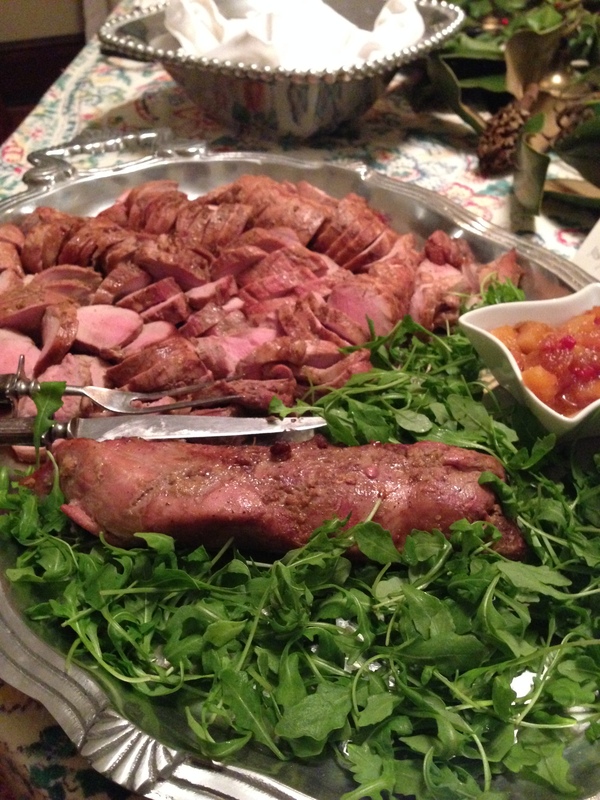 In the past these evenings have often motivated us to bring out the fancy in our cooking repertoires. This time though, we wanted to do something that wouldn’t involve too much time or money to prepare so we could maximize time spent sitting in clusters on the floor, with a beer in one hand and a cup ‘o something warm and home made in the other, listening to bluegrass and reminiscing about the gross and fascinating things we’d all seen during the week. Perfect opportunity for a chili cook off! I doubled the recipe and saved half the batter to make another batch the next day. This one came up Mt. Washington with Chris and me. Actually, it was our breakfast, early snack, rapidly-eaten-(due to freezing fingers)-lunch/snack on the summit, and afternoon snack. Never let us down.